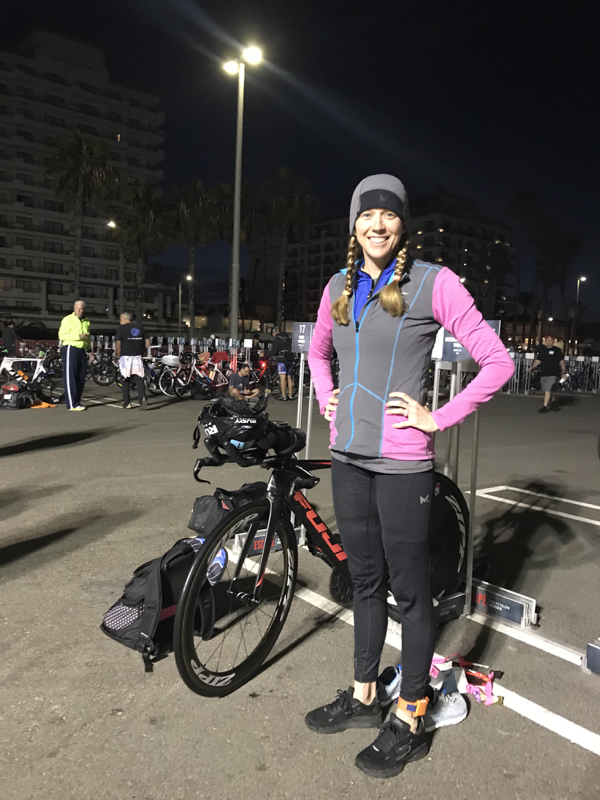 I kicked off my first race of the year in Huntington Beach, CA, which is located just south of LA. Nate, Connor and I made the trip and I did not realize LA was still a four hour direct flight from St. Louis. Fortunately, Connor slept half of the flight and was a happy guy when he wasn’t sleeping. We landed around rush hour on Friday afternoon, so we had a bit of traffic to get to our hotel. Unfortunately the first night we were in CA, Connor had a rough night of sleep and was up at 3:30AM (jet lag didn’t help). However, we were trying to not change time zones anyway! This town is named “Surf City” for a reason. The beach was stunning and was lined with surfers looking to catch six to nine foot surf. The weather was perfect, sunny and 60 degrees in the morning. I had a warm-up ride on a portion of the bike course and ran along the beach sidewalk. 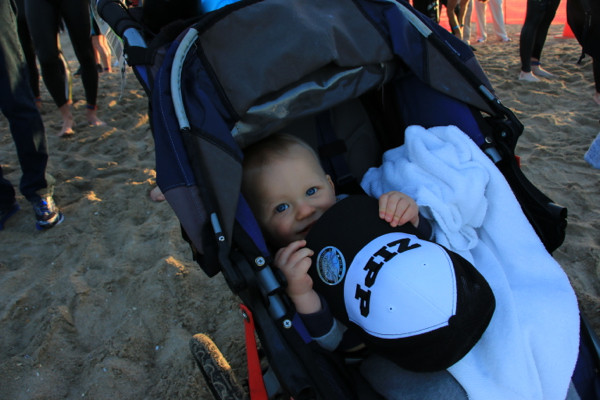 The beach was packed with many other triathletes warming up and locals out for their morning stroll. I felt good on my bike/run warmups and I decided to test out my wetsuit in the hotel pool later in the day. I find the first race of the year I am a bit rusty in my packing and race prep. It’s easy to forget the planning and preparation it takes for race day, but once I get into race mode, it comes back quickly. 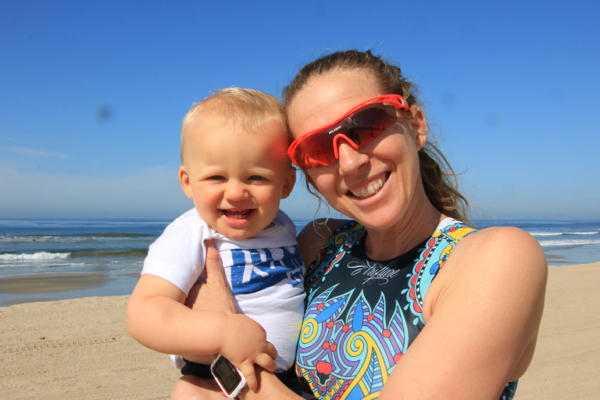 Once we were in California, I headed to the store to get little things like rubber bands for my bike shoes for transition, pre-race breakfast and some baby food for Connor. Race morning didn’t feel too early since I was on the west coast. Nate and I woke around 4:00AM and Connor woke about 15 min later. This made it really easy to have time to get ready to race and nurse Connor. I had my normal race breakfast, although my stomach was not hungry at all and I only had half of what I normally eat! I made a note to try and snack since I didn’t complete the breakfast. 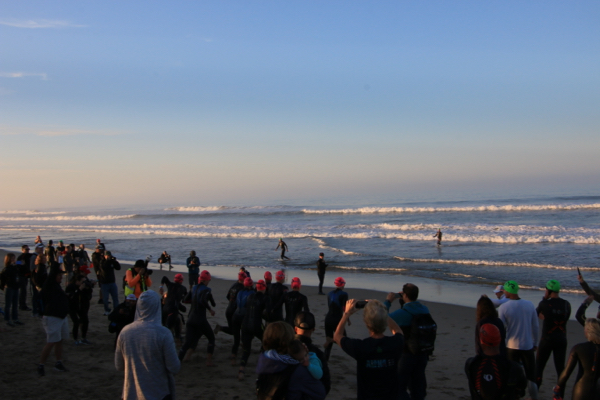 Race start began just after 6:30AM ( two minutes after the men) and it was daunting looking at the huge surf. 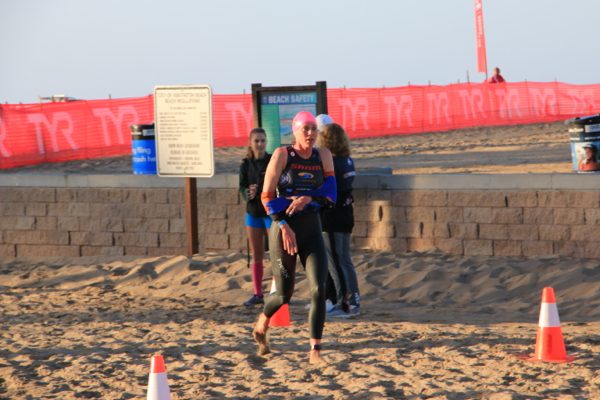 I also did not expect the water temperature to be 56 degrees luckily I had my Blue Seventy Helix to keep me warm. For goggles on the day I used the BlueSeventy Elements in Clear. Once the gun went off I ran about 30 meters and then fell flat on my face twice in two inches of water. I stood up and fell again (and pushed my fingers completely backwards)….fortunately they were completely numb so I didn’t feel the pain anyway! As it turns out there were all these divots in the sand, so it made it really easy to wipe out (I fell coming out of the water as well!). Getting out of the surf was a bit of a challenge. I was third getting out, but soon was swimming in second position. The girl in first (Sophie Chase) had about 20 seconds up on me and I worked the remainder of the swim to get back on her feet. The swim was tough as my body was COLD. It was challenging to keep the tempo up in my arm stroke, but I just focused to keep the arms moving as quickly as I could. Once we hit the surf to come back in, I lost about 25 seconds to Sophie again! Running out of the water was tough. The sand was very soft and I felt a bit disoriented from the waves. My feet were frozen and it was painful to run on the pavement with my cold feet. 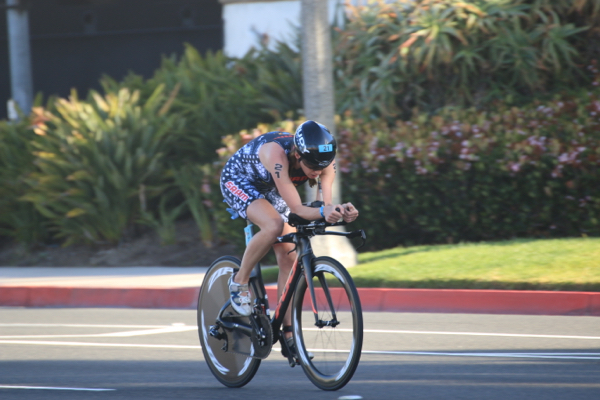 I exited the bike in first position with around a minute lead over second. I started the run feeling good, although my feet were numb until mile 3. The run was a one loop course, so I didn’t have a chance to see where the other women were until the turn around. Once we hit the halfway mark, we had a half mile run in the sand that was extremely soft. I focused on trying to keep my cadence up and get through this section and I also saw that Sophie Chase was right behind me at the turnaround. Once I got off the sand, I knew I had to pick up the pace. Sophie caught me around mile four and I tired to stick with her for a bit, but the pace was a bit too much for me (and I had St. Anthony’s in the back of my mind and really wanted to zone in for that race!). My running gear used was: Altra Escalante-Racer, Mission HydroActice Multi-Cool, Rudy Project Tralyx SX, Triflare Blue Poppy custom Sarah Haskins line, T1 Pro Race belt, and I was able to race in my Groove Life ring all day and not have to worry about my diamond wedding band. I crossed the finish in second. I was very happy for Sophie to have such a great race. Overall, I was pleased with my performance considering it was the first race of the year and it was the first time to really test my body; however, I was disappointed in my bike performance. In the future, I am going to be more proactive with keeping my core warmer in cold swims so that I will be able to push hard on the bike and feel better while cycling after swimming in the cold. After the race, we had about an hour to pack the room (fortunately Connor was napping), head back to race site for awards and then drive to the airport. It made for one extremely long day, but we were glad to get back home by 10:00PM. 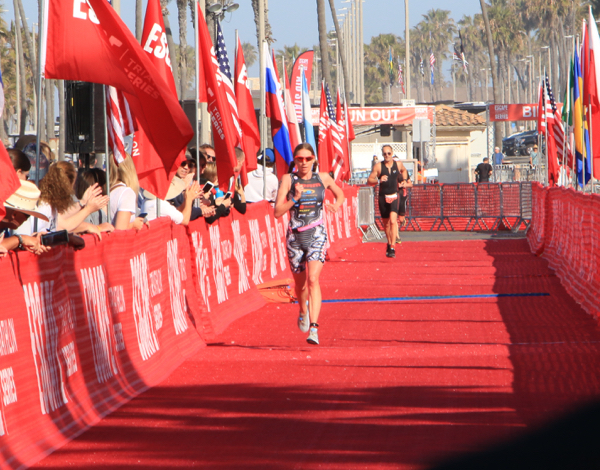 Huntington Beach was beautiful and a race I would definitely repeat in the future.